Why do I say it’s the best? Because the reporter, Joe Emanski, put David Newton’s feet to the fire and brought up the tough issue about how Princeton’s African-American neighborhood was torn down to make room for what is now a beautiful town center. Emanski gave Newton a chance to express regret and yet affirm the result. As below. “Newton says in a way, it was brave to build something like Palmer Square in the middle of the Depression, because it might have been a failure. He doesn’t discount the resentment the displaced residents felt then, or that their descendents feel now, but said that Palmer and his colleagues were in a position where they had to make difficult decisions. “With the benefit of full hindsight it’s easy to be critical, but we’re 75 years on, and I think the benefits to downtown are very positive. The end product was good; the cost it took on families and forced relocation, and plain old racism, was immense,” Newton said…..
Reporters need to ask the painful questions, so that the source has a chance to respond. I liked Newton’s response. Read the full article for great details, like the underground tunnel system where the Christmas tree lights get laid out. 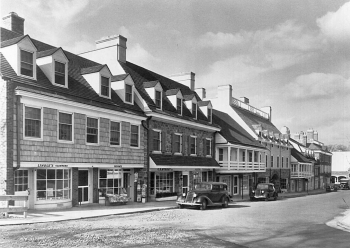 Also, find proof positive that you are right when you tell someone, no, this is not the original Nassau Inn. I’ve had knock-down-drag-out arguments about that with visitors who were certain sure that this building hosted the Continental Congress. But what is authentic, as Mimi O of Princeton Tour Company would be sure to say, is the Norman Rockwell in Princeton’s version of a rathskeller, the Tap Room.